Live streaming has become a popular tool in the recent years. The tools to create the live broadcasting experience to the audience is available easily now with Meerkat, Facebook, Periscope and YouTube offering the technologies. Live streaming has emerged as a new form of content marketing. Big brands are having solid strategy when breaking into the live streaming market. Live streaming helps the brands to connect human to human and to enrich the customer experience by allowing the users to participate in brand storytelling. Questions and answer conversations with the audience is a popular way brand can use for live streaming. User questions can be answered during office hours to keep the customers engaged. Special announcement and product launching details can be informed to the audience through live streaming. Presentations, talks, press conference, tours, demos and another type of live streaming are used by the big brands. Though live streaming is not new, it will always be a thing of great interest for the fans. Even small businesses can gain benefits from the live streaming tool. If there is an event for your small business you can live stream it for people who are unable to attend. It helps build a strong relationship. Provide some exclusive footage to your customers by taking them behind the scenes. Small businesses can use live streaming as a way to make content personal and to humanize the business. It helps in building personal trust. Live streaming is an opportunity for the small businesses to connect with prospects and customers. After the broadcast is finished, the stream can e saved and can be repurposed. It can be used as a blog post on the website. If Periscope is used to promote live streaming the content will stay on the app for 24 hours. It helps the people who missed the stream to come back to the app and watch it. few things to keep in mind is not to mess up with the live streaming as this will not help in getting the benefits. Written content can be repurposed and used as a stream. Live streaming is not scripted and these are spontaneous and this is the best thing about them. 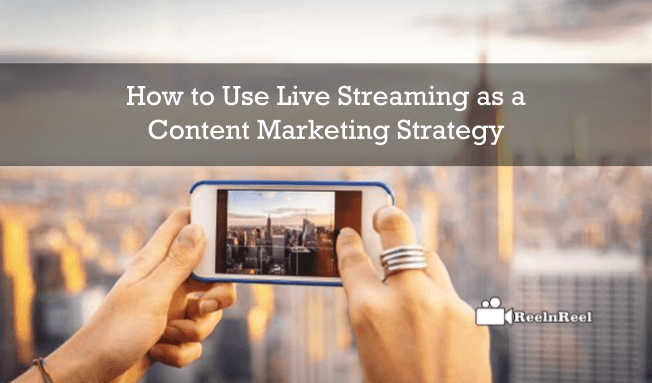 Here are 5 ways to use live streaming as a content marketing strategy. Take the viewers on a tour of the office or the manufacturing unit. Demonstrate the product live and tell the users about the new uses of the product. Live stream the local events and other fun content and entertain the audience. Webinars is another idea for using live streaming for content marketing strategy. Interview a member of the team. There are many examples of live streaming content marketing strategy. a cosmetic company uses Facebook live streaming on a specific day in a week in which the host and a guest give advice and answers the questions of the audience on various beauty topics. The brand could get around some thousands of viewers for its broadcast. Having partner-hosted streams is another strategy followed by the brands. One of the best live content is based on events. Live Streaming is a part of content marketing strategy for big as well as small brands. The benefits of using it for the content marketing cannot be ignored. This content format is surely going to help to reach out the audience and to increase the engagement. Live Streaming Video is a great way for the brands to create a huge impact. New followers can be attracted, and it offers two-way communication. Viewers can interact with the broadcasters through live chats and by posting comments. Hiring a virtual assistant is very helpful for the businesses. These people work remotely. These people help in building the brand online. Virtual assistants handle social media for brands and they can create a social media plan and help in social media marketing. They can manage the Facebook page, Twitter, LinkedIn etc. Virtual assistants focus on engaging the users and help in building the network for the brands. A virtual assistant can work as customer service representatives also is an important tool for marketing. These launch a marketing campaign and track the success of them. Live streaming done via social media sites such as Facebook or YouTube. Live streaming helps in gaining the attraction of the audience on these social media sites. Live streaming video is the fast-growing trend. Marketeer and other live streaming tools can be used to stream the live videos to social media. Show behind the scenes lives videos to the followers. Customers can directly report their issues during live streaming and can get their issues solved instantly. This way, the brands also can get the feedback of the customers directly and make changes to their system if needed.